The Wheel of Wealth symbol is wild, completing the winning combination. The winning combination's payout with one Wheel of Wealth symbol is doubled, with two Wheel of Wealth symbols the payout is quadrupled. When you get 3 Wheel of Wealth symbols on the pay line you win the JACKPOT; in a one coin game the jackpot will be 2,000 coins, with a two coin bet your the jackpot will be 5,000 coins. 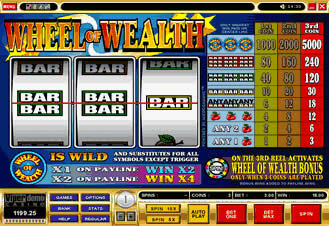 The Wheel of Wealth feature is the bonus game. This game will be activated when you play 3 coins and the Spin symbol is on the third reel.